A long time ago, humans were slaves to the High Fae, until a war broke out and humans won their freedom and gained land to live on due to a wall that separated them from the High Fae. Immediately, the book starts with the main character Feyre out in the woods to hunt for a deer for her family. She ends up having to kill a wolf that was about to kill the deer she wanted for her family. What she doesn’t realize is the wolf was a High Fae, and she’s about to pay the price for the killing the wolf. A beast like a creature comes to find her and take her back over the wall with him to pay the cost of what she did to his friend. Feyre is forced to go with him, and the whole time she’s over at Spring Court, she is worried sick about her family. Feyre realizes while with the High Fae that something strange has happened to them. The blight is plagued their world and Feyre is determined to find out if there is a cure for it. What she doesn’t realize is the blight is not something you want to mess with, especially when the High Fae at Spring Court is scared it’s coming to get them again. What I loved most about this book is how strong-willed Feyre was in the book. She was not afraid to stand her ground, especially against Tamlin (her captor). Feyre ends up going through different emotions with Tamlin though because at first, he’s scary, but then he starts changing to protective over her. Feyre ends up falling for Tamlin, which I found Tamlin a little over the top at times, but he grew on me. The most excitement and craziness comes toward the end of the book when Feyre finds out what the blight is. Let’s say the ending has a lot of action, bloodshed, and sadness. Out of all the characters though, one character that stood out to me in the book was Rhysand. He was fascinating and evil at the same time. I don’t want to go into much detail of what his character was like because I’ll give away his best/worst qualities. He was great though. 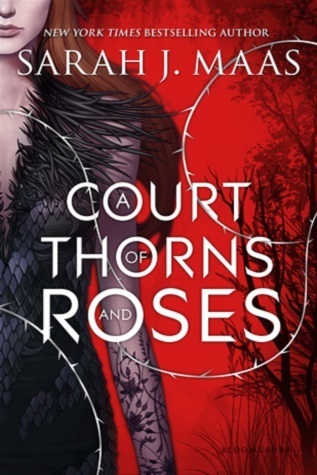 The first book in the Court of Thorns and Roses series is addicting to read due to the storyline and characters. Sarah J. Maas did another fantastic job. Like I said, in the beginning, it took me one day to finish this book. Sarah J. Maas has become a favorite author of mine, especially since her books got me out of my reading slump I was having. If you haven’t read her books, I highly recommend them to fans of Young Adult and Fantasy.